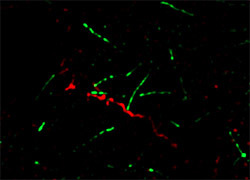 Dipal Patel uses structured illumination microscopy to understand how desmoplakin (red) and EB1 (green), a microtubule protein, interact. When Dipal Patel started working in the lab of Kathy Green, PhD, professor in Pathology and Dermatology, four years ago, she found two interacting proteins that may be a hotspot for mutations that cause Arrhythmogenic Right Ventricular Cardiomyopathy (ARVC), a disease associated with sudden cardiac death during athletic events. Green’s lab investigates desmosomes, a type of cell-cell junction that maintains the structure of tissues such as the skin and the heart. Patel studies a protein in desmosomes called desmoplakin and the mutations that occur with this protein. She found that desmoplakin binds to a microtubule protein, EB1, and began looking at how the two proteins interact to evaluate the role that this action plays in disease development. She discovered that mutations in desmoplakin impair the interaction of these proteins and cause cells to lose the ability to maintain electrical connections with other cells. A sixth-year Medical Scientist Training Program student, Dipal Patel works to characterize disease mutations that may cause sudden cardiac death triggered by strenuous activity. Disruption in electrical signaling between cells can cause defects in the heart being able to beat properly, which leads to cardiac diseases such as ARVC. Patel explains that while many patients have a mutation linked to the disease there is no way of knowing its severity. 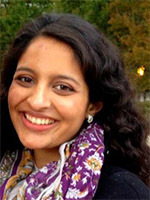 In her latest study, Patel observed a panel of different mutations and found that some of them were more pathogenic, or disease causing, in the cell system than others. Her findings correlated with the outcomes of patients in clinical studies. Ultimately, Patel hopes that characterizing the mutations will help physicians decide the risk of the patient engaging in athletic activities. “If you analyze the mutations you could tell patients if they should stop playing sports or if they should just keep an eye on it,” she said.